Green Mountain Mustard sent me two of their mustards to try. I got to try the sweet hot shot and the jalapeno mustards. I really like the jalapeno but was not a huge fan of the other. This mustard is 100% different from other mustards. It is very creamy and more like a mix between mustard and thousand island dressing. This mustard is made with eggs and other ingredients to make it creamy. It was great on a sandwich with turkey, tomato, spinach, and a pickle. This mustard is higher than other mustards in calories and is 32 calories per tablespoon so that is something to consider. I think that it would be awesome dipped with pretzels! 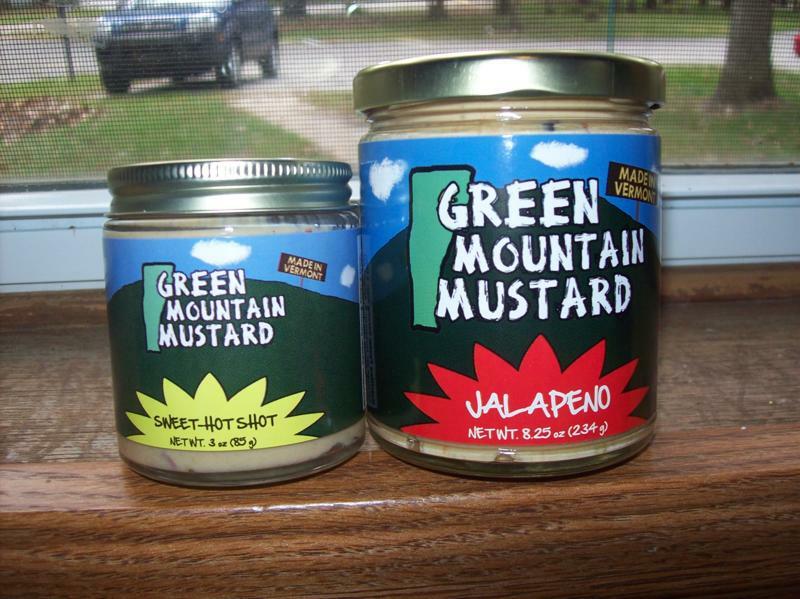 The giveaway will be for one shot pack of Green Mountain Mustard to one lucky reader. The kinds that you will receive are sweet hot shot, maple wholegrain, and sweet mild shot. The giveaway is open until Midnight on Wednesday October 20th. Winner will be chosen on Thursday October 21st using Random.org. Visit the Green Mountain Mustard website and let me know which kind of mustard you would like to try the most! I would like to try Maple - Wholegran Mustard. I love mustard on almost everything that I eat. I also add it to pasta salad, meatloaf, and dips. also, your newest FRIDAY blog follower. would love a follow back. I'd love to try the Maple Wholegrain Mustard. Thanks for the review and giveaway! I love mustard on hot dogs, sandwiches and on hot pretzels. I like mustard OK...but my husband LOVES mustard! The horseradish mustard sounds interesting as well! I love mustard! I even dip french fries in mustard! Amanda, I'd like to try the Jalapeno! I love mustard on all kinds of things, veggies, too! Thanks for a chance to win this giveaway! I subscribe to your RSS feed via Google Reader so I don't miss a thing! Thanks for a great giveaway and chance to win these goodies! I follow in GFC! Thanks for a great giveaway! I entered the Amazon Acai Giveaway too! Thanks for a chance to win these wonderful mustards! I entered Giveaway: $50 to Executive Gift Shoppe. I would like to try Maple - Wholegrain Mustard. I love mustard on my sandwiches, hamburgers, hotdogs and even corn dogs! I also love to dip pretzles in mustard! I'd love to try jalepeno! I like mustard so-so.. however, my husband LOVES it! I'm entered in the foxy originals giveaway! I'm not a big mustard fan..traditional mustard that is. Would love to try something different. Mustard is my choice of condiment always...virtually no calories and it's so darn good! Your already on my blogroll! I am a mustard freak! One year for my birthday my husband bought me a huge box of specialty mustards with all different kinds to try. They were gone by the time the new year arrived (my birthday is the end of October, today in fact!). I'm always picking up new mustards to try. I love spicy, sweet, unusual, vinegary, and mild all equally. I love mustard a great deal. I use it as a dip for veggies and chicken strips.